Beki and Mike Thackwray from Erdington had always dreamed of having a cat, but didn’t think they could because they live in a flat with no outside space. However, when they saw an appeal on Facebook for indoor cat fosterers for the Cats Protection North Birmingham Branch, their luck changed. 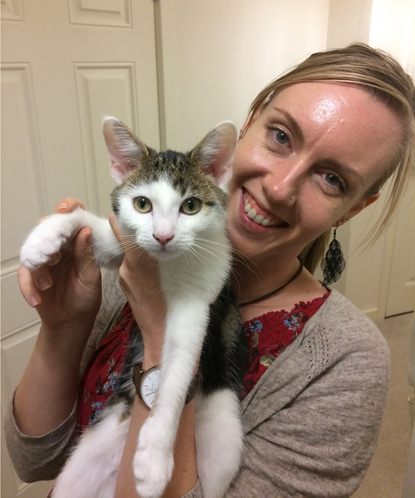 Beki, who works in child and adolescent mental health, said: “Coming home to our foster cats really is our dream voluntary role. So far the cat-loving couple has fostered three pairs of kittens and several adult cats. White-and-black moggy Panda, who is FIV-positive, was the last cat they fostered. Happily, he’s already been adopted and moved to his permanent home. Although Mike, a park ranger, initially thought Beki would be more involved than he would, it hasn’t turned out that way. 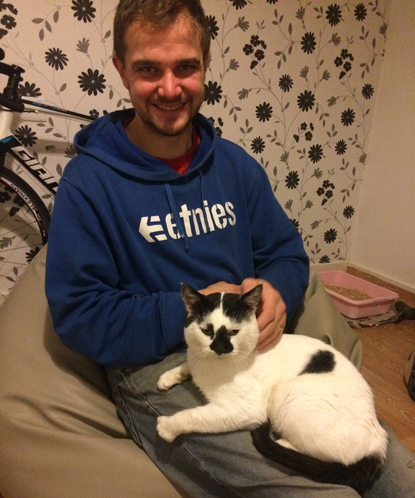 He said: “We’ve both completed online courses so we know how to care for the cats, and we’ve had lots of help and encouragement from Cats Protection. “Sometimes Beki will greet the viewers and potential adopters. Then I’ll get the adoption paperwork completed and register the microchip so everyone can go home smiling and purring. Cats Protection fosterers care for cats and kittens in a spare room, in part of the house or in purpose-built garden pens. The cats can’t go outside or mix with other pets. If you think you could foster for Cats Protection, visit www.cats.org.uk/get-involved/volunteering to find out how to get involved.